I'm giving my mom a lot of "tortitude" talk lately. She is spending too much time on the computer and not giving me the quality and quantity time that I want and deserve. This is what I do to my mom when she is on the computer and I want some treats! I try meowing at first and if she tries to ignore me, I climb up her leg and give her this look. Do you think it works? I'm taking it easy with my Plague Rat today! Today's Photo Hunt theme is framed. I went back to my picture file and found this picture during my "adolescent" years. I was about 2 years old in the picture and when mom came home, she saw this mess on the floor. She looked at me as if to say, "Praline, why did you make such a mess?" 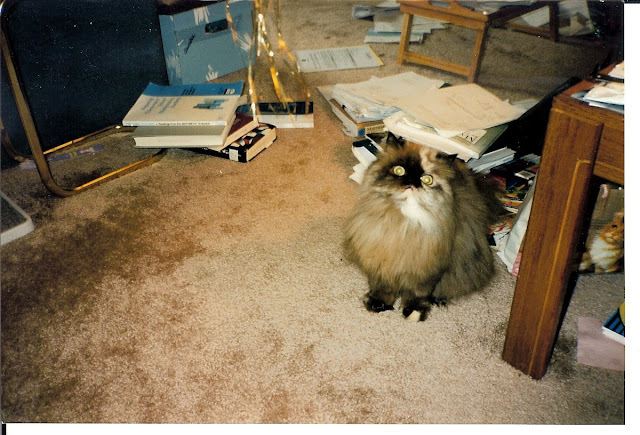 I was framed because mom made the mess when she was working all hours of the night on her dissertation and she forgot that she left all of these things on the floor before going to bed. She tried to frame me for the mess!!! I think I'm still upset because mom tried to frame me! Guess what? Mom finally bought me a Plague Rat from Baby Patches' store, Nip and Bones. At first, I ignored the Plague Rat, but when mom went to go and find it this week, she couldn't find it. After much searching, she found it under the couch. I was playing with it while she wasn't looking. Below are some pictures of me enjoying my Plague Rat. I always end my play with the nip, honeysuckle, or valerian root, by passing out as you can see in the last picture. However, I like to participate in these things and I must admit I did do something that my mom doesn't really like for me to do . . .
What do you mean I don't belong on the kitchen table? This is my house, isn't it? And this is my glass table! 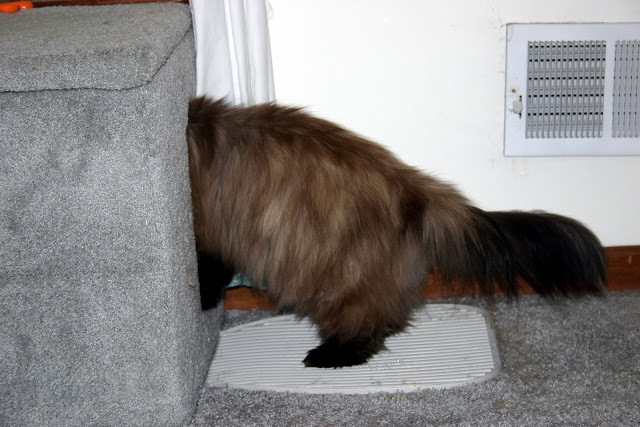 Pee ess - That was my fancy litter box yesterday. It doubles as a piece of kitty furniture for me to look out of the window. For today's Tortie Tuesday, I wanted to show you something unique about my tortieness! If you will look at my lips very closely, you will see that one side is dark like my dark face and the other side is pink. The first time my mom noticed this in a picture, she thought there was something wrong with my mouth. NOT! Those are my unique lips, mom! Cool, isn't it? And also for your pleasure, a picture of my beautiful Tortie back! Meow, meow, meow, meow . . . Mom is going to church this morning to try and play the piano a little bit. She hasn't played since her surgery on June 30, but she said something about needing the green papers and sharing her talent with others. Me - I think I'll just take it easy under the piano until she gets back. Now, just where did that middle C go? If I were to assign a numerical value to my beauty, I would have to give myself a rating of "10". I'm still in a little reflective mood today! Mom's PT is getting a little tougher and she started with some weights yesterday and her shoulder is back hurting again. However, we have each other and I give her purrs and headbutts and she gives me scritches, hugs, and loving, so we are going to be great! Thank you so much for the compliments about my video yesterday. Mom and I just put it together from our hearts and we wanted to share our emotions with the CB. If you would like the code to embed the video anywhere, you can get it from You Tube at http://www.youtube.com/watch?v=0umE_hDokak. The background music on the video yesterday was from the musical, "Cats", which is one of my mom's favorite songs and musicals. I thought I would share a clip from the Broadway musical, "Cats", today and let you hear the words and see the powerful performance of this amazing song. Tell your moms and dads to get out their tissues again. I had to wipe the keyboard again while mom was helping me put this together. It's been a sad week this week. 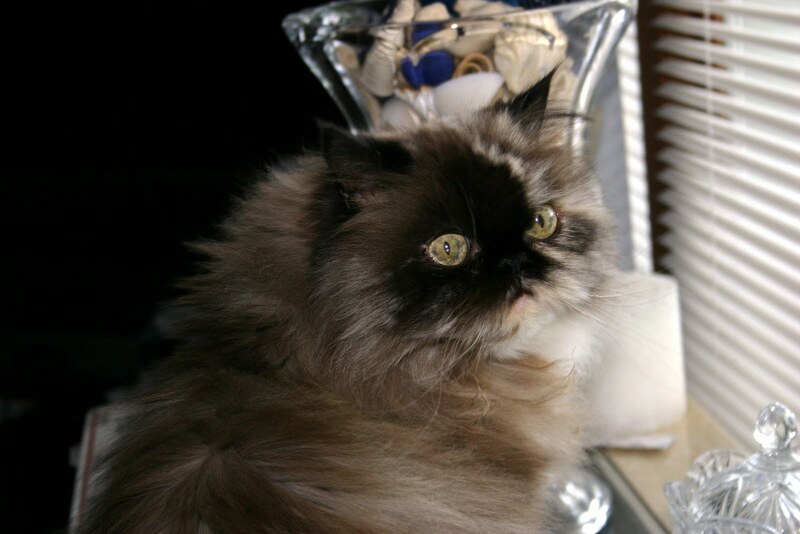 The CB lost some long-time furriends, Luxor and Fat Eric and some of my newest furriends: Molly and Wintergreen. Today is a day for remembering and reflecting. 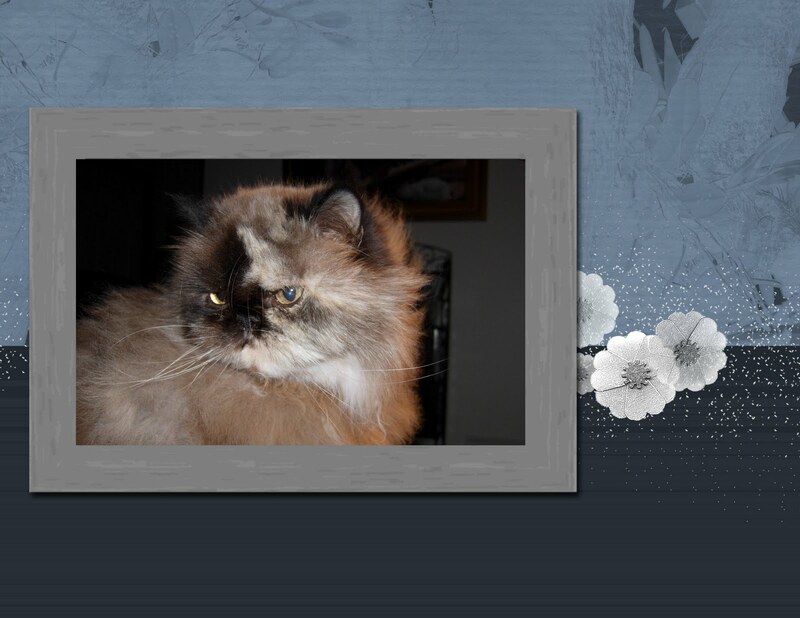 Mom helped me put together this simple little video for remembering my furriends. I hope you will join me in sending comforting purrs to the moms and dads that are left behind. By the edge of a woods, at the foot of a hill. In a lush, green meadow where time stands still. For here, between this world and the next. Had turned into joy once more in each heart. Labels: Letting the wind from the fan blow through my floof. I've shared with you before the fact that mom let's me eat my stinky goodness in the living room with her, even though I make a huge mess. Here's a picture of my stinky goodness on the carpet and mom is just sitting there watching me. She says it's more important to keep me happy than to have a spotless house. Mom does feel a little better. She is pretty tired, but she did okay at work. She fell asleep on the couch while watching TV last night. I am a star. I won the Funniest Vet Stories and as a result will have a 6 month supply of Feline Pine litter and a gift card good for my next vet visit. Go over to Romeo's blog to read more about it and I'm featured on People Pets. Yippee! This is my "evil-eye" look to tell my mom to take it easy as she goes back to work today. She is feeling a little better, but the infection appears to have moved down into her chest. I wonder if I could put a spy camera on her to make sure she isn't pushing it too much! I'm keeping an eye on my mom today to make sure she is taking it easy. She went out with the grandma bean on a couple of errands yesterday and had two major dizzy spells. Mom is doing okay right now, but I am keeping my big eyes on her for the day! Today's Photo Hunt theme is orange. I thought I was going to have to ignore the theme today because mom and I just don't do orange. It's a college sport's thing in S.C. You see, Mom is a die-hard South Carolina Gamecock fan and their colors are garnet and black. The rival institution in S.C. is Clemson University (which is where mom earned her Ph.D.) and their colors are orange, white and purple. The only thing mom has in the house that is orange is the "hood" from her Ph.D. robe which has orange and purple in it. However, while mom was eating her supper last night, I pointed out to her that the cheese on her potatoes was orange. Mom said, "well, what do you know? You're right, Praline." Yay! So here is my theme for orange. Pee ess - mom's URI has moved into her chest and she is coughing a lot now. She's hoping the meds will really kick in this weekend. Whew! It's been a rough week for lots of my furriends on the CB. Both Sniffie and Chey had surgery yesterday and we're waiting for results of biopsies. 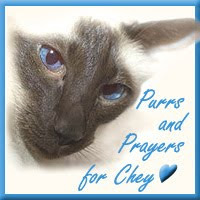 Please keep purring for them and go over and wish them well. My mom had to go to the human vet yesterday and she has some type of URI. She's on two different medicines and is staying home today, so I'm back on nursing duty. I'm thankful for my stinky goodness. Mom feeds me in the living room at night so I can be near her and she doesn't even fuss at me when I get food on the carpet. 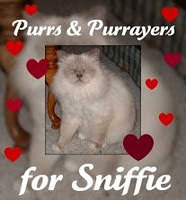 Please send special purrs to my furriends: Sniffie and Chey. 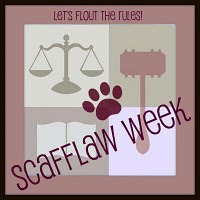 Sniffie is having surgery today to remove a lump and Chey has been very sick and hasn't been eating. Since I can't use my floofy paws to blog too much since Mom won't be home until tonight, I thought I would share another Baby Praline tortie picture with you. Would you believe that I will be 15 years old next month? I sure am glad that my mom took bunches of pictures of me a long time ago and has scanned them into the computer. Have a great Tuesday! Mom is out of town again! She's up in Providence, RI at some meeting and she left me home alone for my grandma bean to look after me. I'm trying to get into the computer to update my blog and it's pretty tough with these paws. Good thing mom knows how to pre-post my blog. 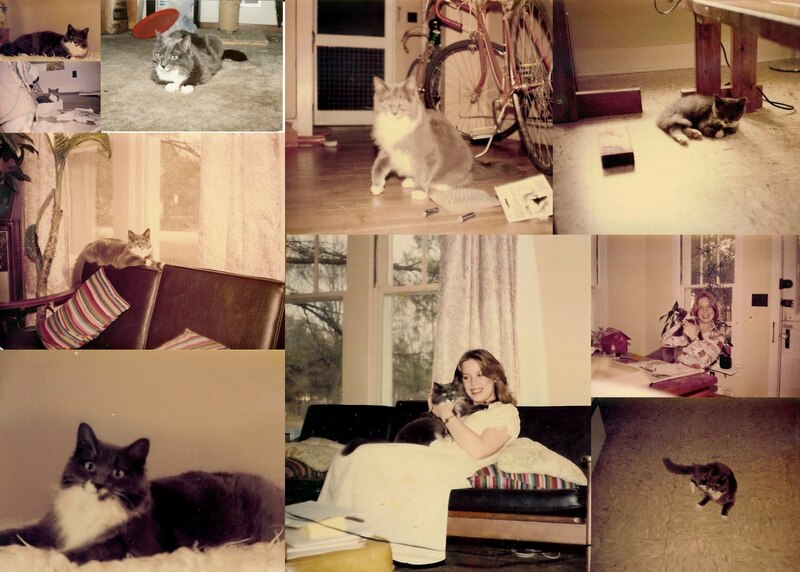 Today is World Cat Day, a special day to recognize all the cats of the world. Of course, I believe everyday is cat day. 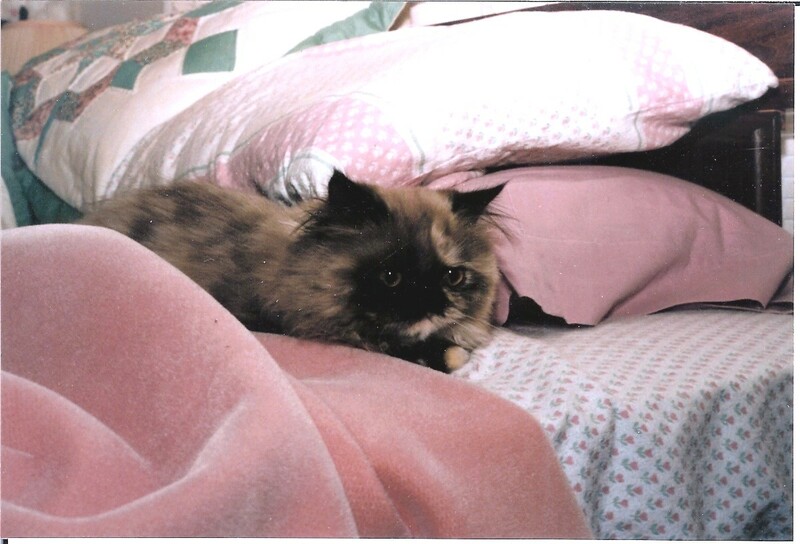 I also wanted to leave a special memory of my sister before me, Muff. Muff was mom's first cat who lived to be 19 years of age. Muff left with my mom's ex-husband when he left her and she went to the Bridge 5 months after I came to live with mom. Today's Photo Hunt theme is Colorful. I just love my colorful fuzzy friends in my bedroom! Can you also tell that I love blue and red? Guess what I got this week from the lady in the blue shorts? My Christmas in July package came earlier this week from Fiona and Harry Spotter. Just look at all of these gifts and they are for me!!! Of course, you know I insisted my mom open my bag of treats immediately. They are so tasty! They must be for me to open my little mouth that wide. I also have a new mousie to play with and some catnip spray to spray on my older toys. And look, I have some grass to grow. I've never eaten grass before. And just look at my new cubes. These are going to be fun! Thank you so much Fiona and Harry Spotter. I think I'll stay in here for a little while. I just love my presents. Can't you see me smiling? I'm thankful for the healthy sunshine and for the sun puddles it makes for me to lie down in. However, sometimes, the sun can also be very hot. Then I am thankful for a cool house with AC! Most of you guessed correctly yesterday - that was my "I want treats now" meow and yes, it worked. Did you also notice that my lips are two different colors: dark on my dark faced side and pink on my light faced side. I'm also thankful for my special furriends and their moms on the CB. 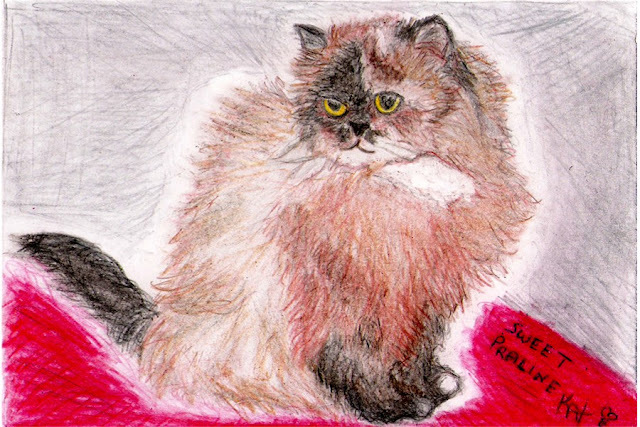 Just look at the special sketch that Jan from Jan's Funny Farm had Katie from Katiez Furry Mewz do for my mom for a recuperation gift. My mom already has it in a frame. Thank you so much Jan and Katie! Your thoughtfulness really did make my mom smile when she got this on Monday, which happened to be a rough day for her physically (she was in pain all day).